A local area network (LAN) is a devices network that connect with each other in the scope of a home, school, laboratory, or office. Usually, a LAN comprise computers and peripheral devices linked to a local domain server. All network appliances can use a shared printers or disk storage. A local area network serve for many hundreds of users. Typically, LAN includes many wires and cables that demand a previously designed network diagram. They are used by IT professionals to visually document the LANs physical structure and arrangement. The Network Logical Structure Diagram is designed to show the logical organization of a network. Shows the basic network components, network structure, and determines the interaction of all network devices. The diagram displays basic devices and zones: Internet, DMZ, LAN, and group. Clarifies what network equipment is connected, describes the major nodes in the network, gives an understanding of the logical structure of the network as well as the type of interaction within the network. Local Area Network Diagrams visualize the communication schemes of LAN, and the networks arrangement in houses, offices and buildings. They are used by IT professionals to visually document the LANs physical structure and arrangement. ConceptDraw has 1004 vector stencils in the 40 libraries that helps you to start using software for designing your own Local Area Network Diagrams. You can use the appropriate templates and stencils from Computer and Network Diagrams objects library. Computer Network library, contains 29 icon symbols of devices and equipment. Use these shapes for drawing LAN, MAN and WAN diagrams at physical and logical levels, network architecture, topology, wiring and layout schematic and plans. Computer peripheral devices library, contains 20 icon symbols of computer peripheral devices. Use these equipment shapes for drawing network diagrams. Computers and network isometric library, contains 56 3D icon symbols of computer and network devices. Use these equipment shapes for drawing diagrams of computer and telecommunication networks, LAN, MAN and WAN architecture, physical and logical topology, wiring schematic and cabling layout plans. External digital devices library, contains 15 icon symbols. Use these equipment shapes for drawing computer network diagrams. Internet symbols library, contains 11 icons of equipment symbols. Use these Web shapes for drawing computer network diagrams. Logical network diagram library, contains 16 icon symbols. Use these shapes for drawing logical computer network topology diagrams. Logical symbols library, contains 38 icons of logical symbols. Use these shapes for drawing logical computer network topology diagrams. Network hardware library, contains 27 icon symbols of network hardware. Use these shapes for drawing computer network diagrams. 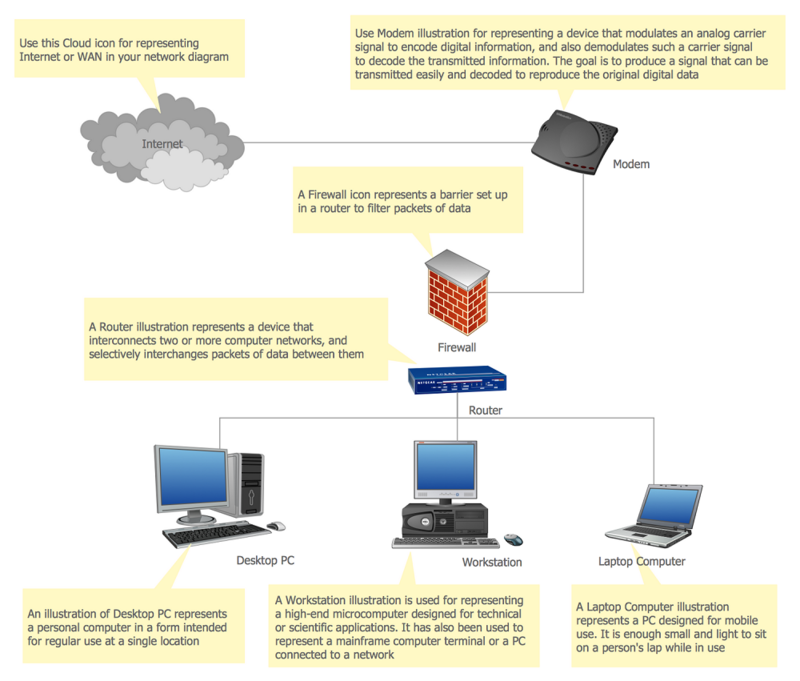 Using a comprehensive set of graphics covering all elements of computer networking for designing local area network (LAN) diagrams. The samples you see on this page were created in ConceptDraw DIAGRAM using the Computer Network Diagrams solution, and they demonstrate some of the solution's capabilities and the results you can achieve. Computer Network Diagrams solution contains samples, templates and libraries of network icons that will help you create professional-looking network diagrams quickly and easily. A network diagram represents the set of computers and network devices and the connections among them. This scheme can be developed for any institution or establishment. To illustrate this concept let’s take for example, a hotel network topology diagram or a school network diagram. 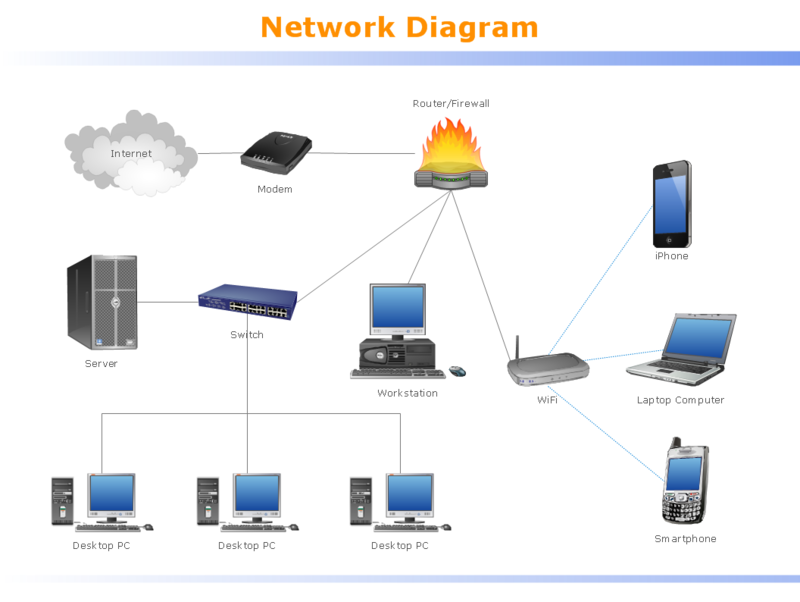 These diagrams depict access points, servers, workstations, firewalls and another equipment needed to provide a network. On this masterpiece drawing one will see a simple scheme a of connecting computers together. Such form of connecting can be applied for a hotel, guest house, bungalow, hut or something else. This diagram shows the images of the real LAN components. So, it represents a physical category of a network construction. It looks similar to a star - so this network configuration is named a star topology. The typical feature of this construction is a center point - usually it is hub, or router. The rays of this star means network connections. Computers, peripherals and other network details are placed on the ends of the star rays. A Wireless network is a type of the computer network that uses the wireless connections for connecting network nodes for data transfer. The wireless networks are very useful, inexpensive, popular and widely used. They are easy setup and do not require the cables installation. 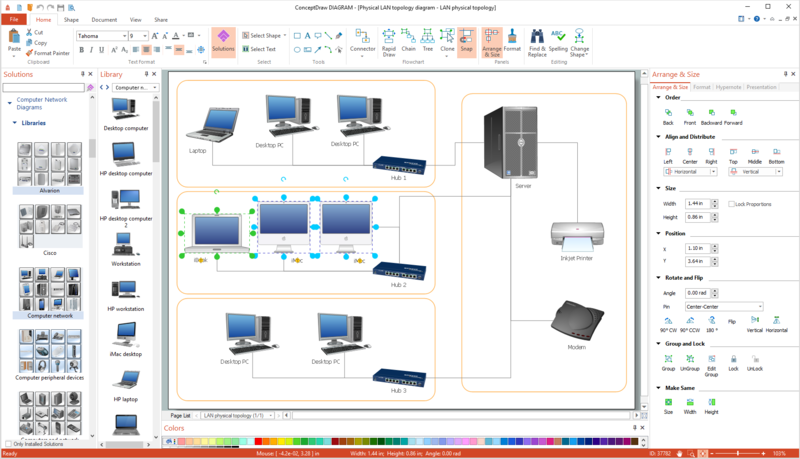 Using the solutions of the Computer and Networks Area for ConceptDraw DIAGRAM v12 you can design the wireless network diagrams of any complexity quick and easy. The vector stencils libraries: Block Diagrams, Blocks with Perspective, Callouts, Connectors, Raised Blocks from the solution Block Diagrams contain specific block diagram symbols such as arrows, input/output symbols, start/end symbols, processing symbols, conditional symbols, commenting symbols, callouts, connectors, etc. for ConceptDraw DIAGRAM v12 diagramming and vector drawing software. The Block Diagrams solution is contained in a "What is a Diagram" area of ConceptDraw Solution Park. Use the libraries from the Block Diagrams solution to draw block diagrams for your business documents, presentations and websites in a few minutes. 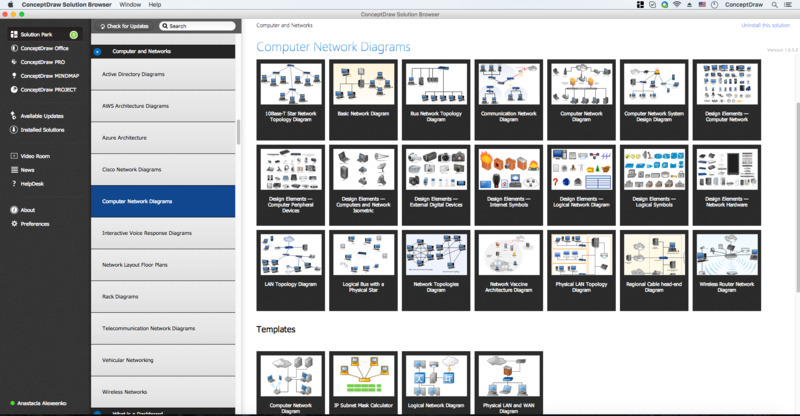 ConceptDraw DIAGRAM v12 is perfect for software designers and software developers who need to draw Computer&Network Diagrams. ConceptDraw has 1004 vector stencils in the 40 libraries that helps you to start using software for designing own Network Diagrams. You can use the appropriate stencils from Computer and Network Diagrams library with 56 objects. Planning a computer network can be a challenge for a junior specialist. However, knowing how to draw a computer network diagrams isn’t a rocket science anymore. There are a lot of special software for creating such diagrams with predesigned templates and examples. The core for Network Fault Tolerance System presented here, is the equipment of Cisco. You can see here the certified Cisco equipment icons. 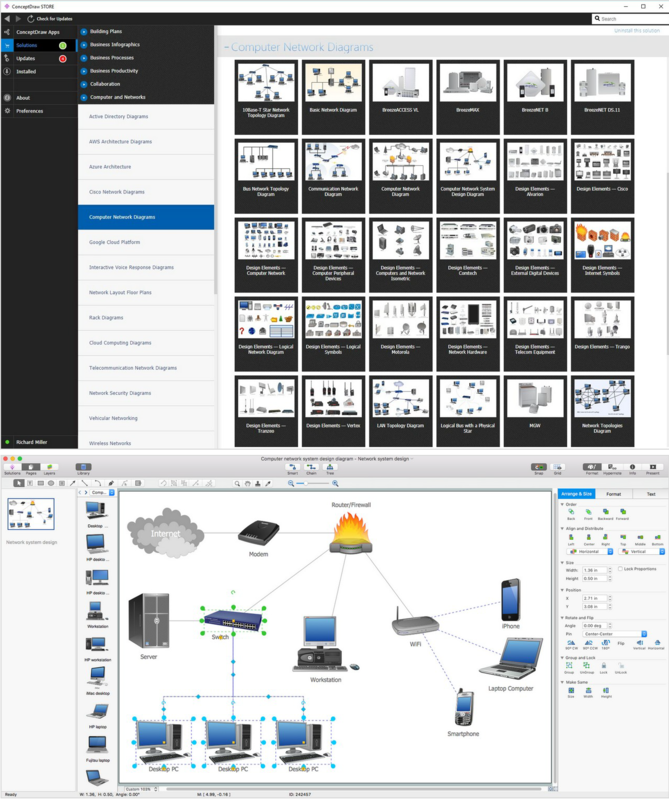 Generally, ConceptDraw DIAGRAM v12 libraries contain more than half of a thousand objects representing the standardized images of Cisco equipment. ConceptDraw solution for network diagramming is a great network diagramming tool for any level skills - from students to network guru.